Explanation: If you've been unhappy with the weather on Earth, check out Mars, now in the grip of a planet-wide dust storm. 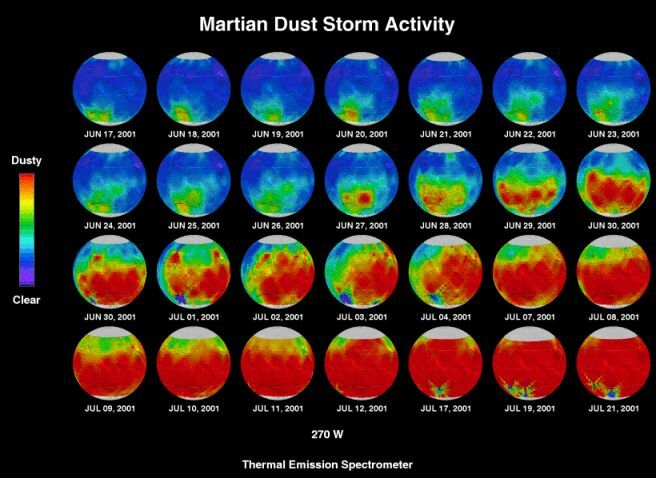 Above, observations from the orbiting Mars Global Surveyor (MGS) spacecraft illustrate the storm's progress through July 21. The series of dated frames show measurements from the MGS Thermal Emission Spectrometer which can determine both temperature and amount of atmospheric dust. Dust data has been plotted on maps of the martian surface with blue representing relatively clear atmosphere and red colors indicating increasing concentrations of dust. In mid June, scientists first noticed the beginnings of the storm in Mars' southern hemisphere and have watched it grow to obscure most of the planet. Unfortunately for Mars-watchers, the timing of the storm has hidden the Red Planet's surface from view during its period of close approach to planet Earth.